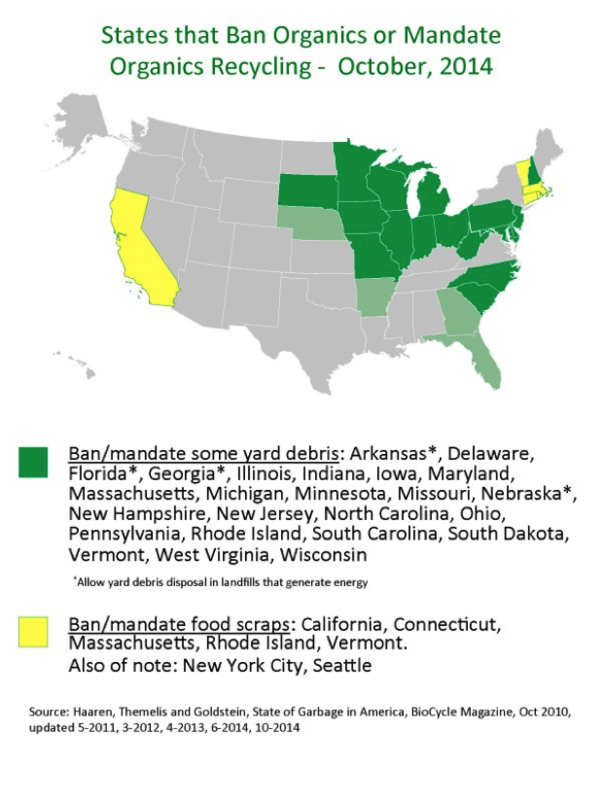 Numerous states have banned yard debris from landfill disposal in past decades, and in some places, efforts to reverse those bans have occurred. Since then, there have been increasing efforts to ban organics –including food scraps--from collection in states and cities. Attempts to turn back bans of organics in landfills have been launched, and we continuously oppose these. To fight these repeals, we are taking a two-pronged approach. First and foremost we work with groups within the affected states to lobby the legislatures and rally their supporters, because each state’s needs are unique and the issues and strategies are different. If you see similar issues arise in other states, please alert our Legislative and Environmental Affairs Committee staff liaison, Cary Oshins. We also work with our chapters and allies in states to PROACTIVELY introduce legislation that will support expansion of the organics recycling industry. Recently California, Massachusetts, Vermont and Connecticut plus New York City have all approved policies and legislation to increase organics recycling and reduce disposal.